Stock Motorcycle he rented from Shawn Gann. It was only fitting that a true New England native son should do the deed first, so Sam was the one to start off the race, and what a race it was. There was day after day of elbow to elbow crowds, bright sunshine and thunder in the White Mountains of New Hampshire. North East drag racing fans have been clamoring for a true “National Event” like this since the 1970’s. It was quite the crowning achievement for the business entity known at New England Dragway Inc. to bring the National Hot Rod Association back to this race track and raise the bar to earn the right to host an NHRA “Mellow Yellow” series race held at New England Dragway. The track formed by a band of New England Hot Rodders opened the gates in September of 1966. 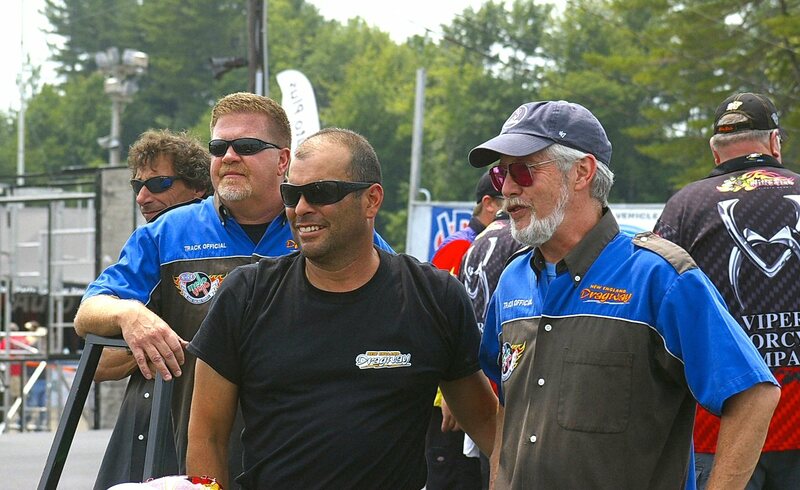 The New England Nationals was their crowning achievement, and the class of Pro Stock Motorcycle was very much a part of the action. 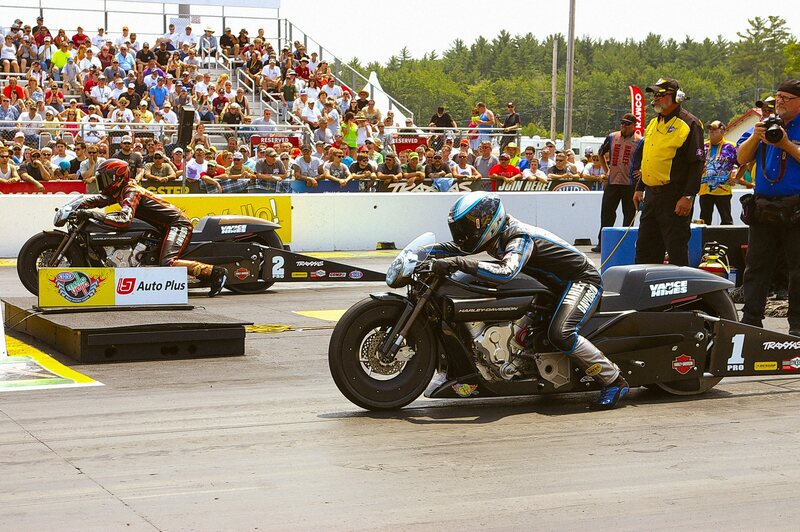 The last time Pro Stock bikes ran at New England Dragway, was 1994, during the AMA/PROSTAR years of racing. Nineteen Pro Stock Motorcycles (P/S-M) entered the race with racers from as far away as Medford Oregon, (Scotty Pollacheck) trying to qualify for the sixteen spots on race day. There were two rounds of qualifying on Friday and two more on Saturday. The number one qualifier was Michael Ray of New Braunfels, Texas driving the Sovereign-Star Racing Buell tuned by George Bryce of Star Racing. Ray tripped the timers with a 6.83 elapsed time at 197.05 miles per hour. The bump spot for this race was a 6.999 by number sixteen qualifier, Angie Smith, of King, North Carolina. The three racers who were not quick enough to crack the bump spot were Joe DeSantis, Michael Phillips, and Sam Hurwitz. Sam’s rented machine didn’t have the ponies to make the field. In four runs the bike yielded, 180.55, 182.08, 185.69, and 185.69-mph. The bike just didn’t have the horsepower for Sam’s team to apply it, the bike was 11.36mph slower than Michael Ray’s machine. 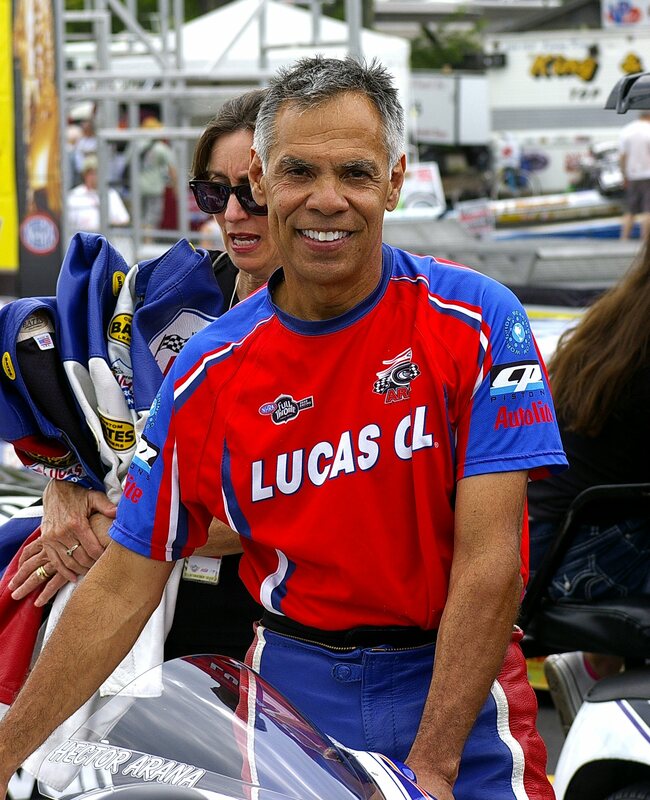 However Sam was thrilled to be back in the Pro Stock Motorcycle pits and was well received by all his peers who’d love to see him back racing at the NHRA level again. In a post race interview, Sam stated, “I’m looking the NHRA Las Vegas event, October 24-27, if I can rent a Buell powered bike for that race, there’s a good chance I’ll go for it.” Funding is number one, if Sam can find the backing, and rent a competitive machine, his driver’s bag is packed. Sam’s local team mates, Crew Chief Rick Stetson, assisting mechanics, John Civitarese, and Ed Hughes are all ready for a phone call from Sam. Time will tell if this team can get it together. On Sunday when eliminations began, number one qualifier Michael Ray was paired with Angie Smith who sat on the #16 bump spot. When they staged the bikes, Angie went right for the jugular with a .006 reaction time as they left the starting line. Ray had a respectable .029 R/T, but that .023 second jump start by Angie had Ray playing catch up for most of the race track. At the finish line Ray had a much quicker 6.882 to Angie’s 6.997 that earned Ray a trip to round two of eliminations. Also in round one action, Mike Berry took out Hector Arana Jr., Steve Johnson took out Scotty Pollacheck, Adam Arana, defeated Jim Underdahl, Hector Arana beat Shawn Gann, L.E. Tonglet beat Andrew Hines, Matt Smith defeated Eddie Krawiec, and John Hall took out Jerry Savoie in a very tight race by a matter of inches. In round two of eliminations, Ray defeated Mike Berry, 6.91 to 6.98, veteran Steve Johnson fell to rookie Adam Arana, 6.95 to 6.91, Hector Arana, was defeated by LE Tonglet 6.95 to 6.94, and Matt Smith red lighted to team mate John Hall, sending Hall on to the next round. In the semi-finals, with only one round of racing remaining, things get interesting. Michael Ray who had the quickest and fastest bike of the day had the number 5 qualifier Adam Arana for this round. When the tree came down, Arana, a first season rookie, responded with a .035 reaction time. Ray, delivered a .052 reaction time. In the previous round Michael used a .009 reaction time to eliminate Mike Berry. His conservative delivery on this launch cost him the round and the race. On the other half of the competition ladder, John Hall out of the Matt Smith, Viper Racing stable strapped a .004 reaction time on LE Tonglet who went down 6.952 to Hall’s quicker 6.927 and this set the stage for the final race of the day between 21 year old rookie Adam Arana and 42 year old John Hall of Hamden, Connecticut. Hall has been motorcycle drag racing since Adam was barely 5 years old. Yet when the two racers advanced, in one very important way they were both quite equal: neither of them had ever been in an NHRA P/S M final round before. 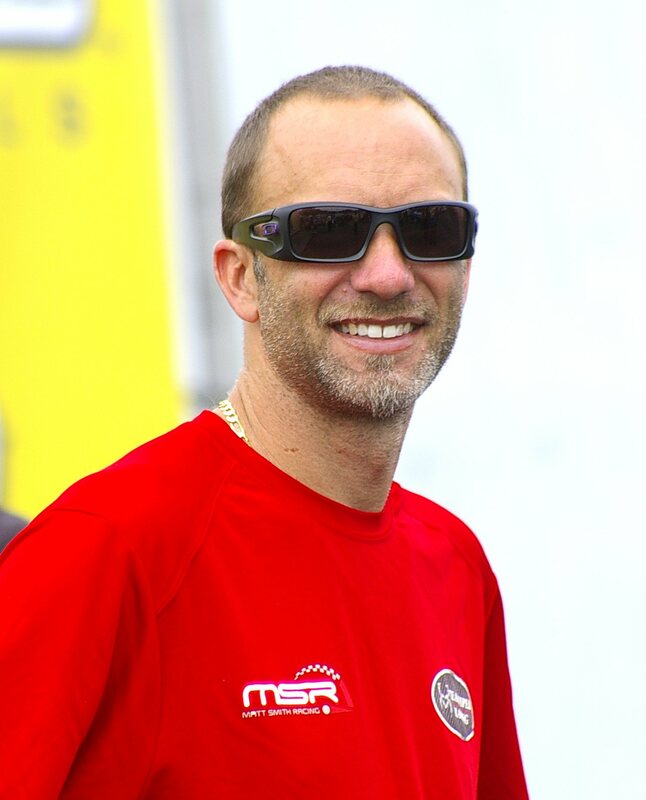 When the two bikes staged, Adam moved first in the worst possible way; he fouled at the start with a .070 red-light that instantly handed the win to John Hall, his first ever in NHRA Pro Stock Motorcycle competition. Hall’s knife edge close .004 reaction time in the previous round made him stage in a more conservative manor in the finals: he didn’t want to red light this chance away. This made him cautious in the final round. It was too bad Adam lost his chance to win his first race on the starting line. Both bikes and drivers delivered identical elapsed times of 6.924 seconds! As so often happens in Pro Stock Motorcycle racing, the race was decided right on the starting line. P/S-M at the NHRA level of racing is truly one of precision. Professionalism and sportsmanship are hallmarks of the class. On the top end, just moments after the race, Adam Arana stepped off his drag bike, walked over to John Hall and shook his hand, “Great race man.” It was their first final round appearance, but I’m sure it will not be their last. 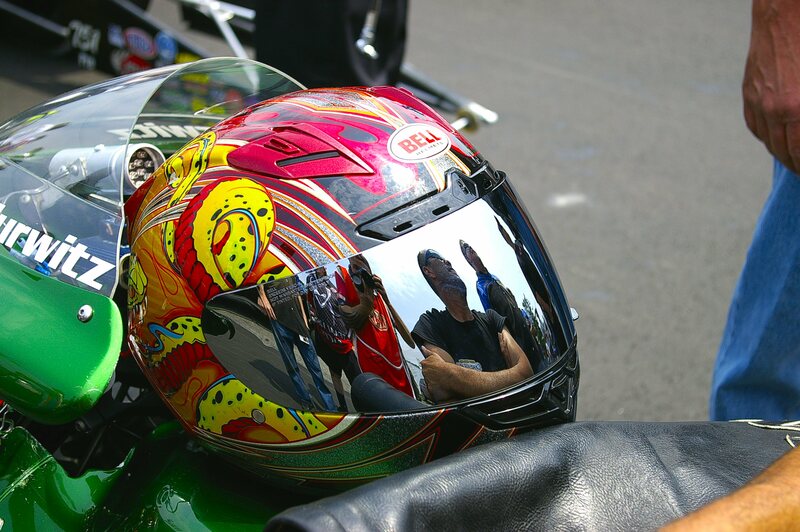 Adam comes from a long line of Pro Stock Motorcycle racers in the Arana family; his brother Hector Arana Jr. started in the class during the 2011 season and their dad, Hector began back in 1994. Clearly the Arana family racing will be around for years to come. As for John Hall, he first crawled onto a drag bike in 1996. He’s now in his second season of racing with the NHRA in the P/S-M ranks. 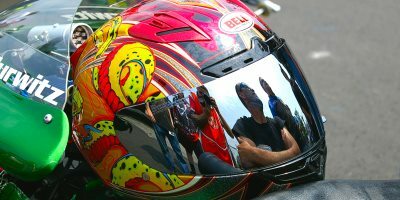 When he chose to sign on with Matt Smith Racing who represents the Viper Motorcycle Company, Hall chose wisely and now has his first NHRA win to his credit. When he was reached for comment after the race on Monday night, the reporter had to wait: Hall was about to enter the staging lanes at a local Go-Karting track. You gotta love a racer who goes racing after a race to relax.